Nobuhiko Obayashi’s “Bound for the Fields, the Mountains and the Seacoast” (野ゆき山ゆき海べゆき, 1986) was one of a string of pictures during the 1980’s that critically explored the era when Japan began to exponentially militarize, an action which ultimately resulted in a clash between itself and several Western powers. Isao Takahata’s “Grave of the Fireflies” (1988), Seijun Suzuki’s Taisho trilogy, and Masahiro Shinoda’s “Childhood Days” (1990) all focused on the effects of wartime on its civilian populace. They successfully illuminated the tragic consequences that occurred because of Japan’s misguided confidence in their military, but due in part to their subject matter were dour affairs. “Bound for the Fields, the Mountains and the Seacoast” does follow several of these same tropes, but Obayashi does not fall into the trap of obsessively documenting every suffering indignity that the Japanese had to endure at this time. He is much more inclined to depict, in a small coastal village at the turn of the century, the comings and goings of a few school children – as usual, the typical front-and-center subjects in an Obayashi story. Former Super Sentai Junichiro Katagiri is cast as the belligerent Sakae, Yasufumi Hayashi as the pubescent Soutaroh Sudou, Isako Washio as the tragic heroine O-Shouchan, and Obayashi regular Toshinori Omi as the conflicted pacifist Yuuta Hayami. Sakae enters middle school not only as the new kid but also as one far older than the rest of his classmates. His inflated sense of self soon results in a war erupting, thanks to the entire student body hating him. Caught in the middle is Soutaroh, who detests fighting but seems to relish the idea of being a hero, a fantasy that gets fueled even more due to his crush on Sakae’s sister O-Shouchan. The conflict between Sakae and Soutaroh comes to a head when both boys realize that O-Shouchan has been sold to the local brothel to pay for her parents’ debts. “Ozu-esque” is an often abused label thrown around to describe any Japanese film that attempts to portray everyday reality in a subtle poetic manner. However, in regards to Obayashi’s picture it’s apt. “Bound for the Fields, the Mountains and the Seacoast” is for the most part not beholden to plot machinations. This does not mean that the film lacks a cohesive storyline; rather, the film takes its time to develop characters, and show scenes of school and town life. As in classic Ozu what is of greater importance are the quiet and mundane moments that often get cut out from typical commercial cinema. Even Ozu’s brand of childish humor is present, though unlike the grandmaster, Obayashi’s jokes fall mostly flat. The film only breaks form during the picture’s climax and final moments, wherein Obayashi’s experimental streak explodes into stark black and white, as each character disintegrates in a cloud of magician’s smoke before our very eyes. Of course what many will probably notice is the politics in the picture. As a child during the war years the director obviously has a negative viewpoint towards war and even the military itself. His characterization of the military man Chuui Aoki (Kôichi Satô) is equally ridiculous. Some might look upon Obayashi’s caricature of the Japanese military and scoff at how defanged he makes them out to be, even though they were a very powerful and oppressive force during that era. Yet, careful scrutiny of the story actually shows the director to be an astute satirist paralleling the fighting being done by the Japanese military as something akin to a bunch of boys playing war – a sentiment first addressed by Seijun Suzuki in his 1966 picture “Fighting Elegy.” The naïveté that characterizes Sakae and Soutaroh is a mirror to the countless young men conscripted into the army believing that warmongering was an honorable profession. 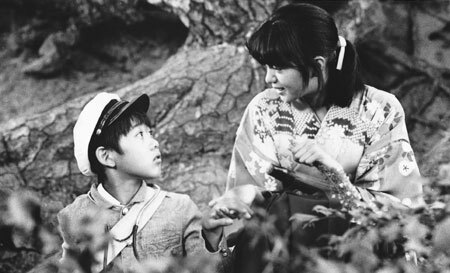 Although “Bound for the Fields, the Mountains and the Seacoast” doesn’t quite reach the heights of Obayashi’s other masterpieces it is a worthy entry in his filmography. His attempt at imitating Ozu’s laconic style revealed just as much about Obayashi’s own proclivities, and his deepening interest in the past forced him to confront his own nostalgia, channeling the bitterness and anger he felt into something that audiences could digest. “Bound for the Fields, the Mountains and the Seacoast” will screen on Sat., Nov. 21 at 4:00 p.m. as part of the Japan Society New York’s Nobuhiko Obayashi retrospective this year. For more information, visit www.japansociety.org.